Last night’s game at Dodger Stadium was EVERYTHING you could have wanted in a baseball game. It was an early instant classic of the regular season. And I had the pleasure of watching the entire thing for the most part. The Dodgers looked in control of this one, and should have won the game. National League MVP candidates Kris Bryant and Corey Seager squared off. With the Dodgers up 4-2 in the 8th inning after an Adrian Gonzalez home run, the Cubs needed life. Bryant crushed his 34th home run of the season to cut the deficit to 4-3, and this put his average over .300 on the season. Things weren’t done from there. Kenley Jansen entered in the ninth, and if you watch baseball at any regularity you figured this game was ending 4-3. But Jason Heyward made himself somehow-useful. He doubled off Jansen to begin the ninth and would score the tying-run with one out on a wild pitch. Bonus baseball was awarded with Vin Scully on the call. And I might have to change my MVP vote from Seager to Bryant on a count of what happened next. 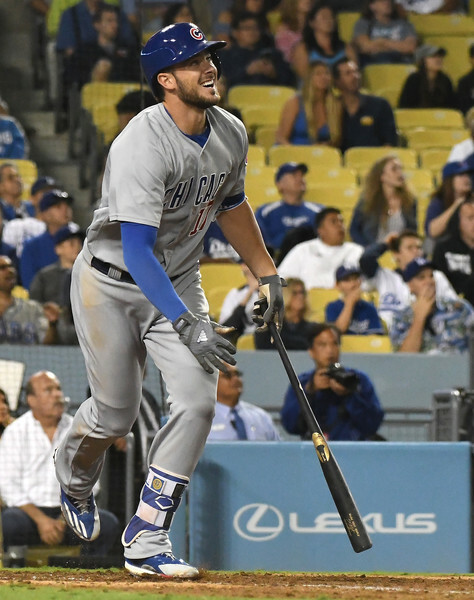 Bryant comes back up against a southpaw – Dave Roberts has no clue how to manage a bullpen, God love him – and Bryant hits a predictable two-run shot that ices the game for the Cubs. It was his 35th home run of the season and he’s at .303 on the year. The Cubbies absolutely stole this one with their best player headlining it. We’re all better off having seen this one, if you saw it.